Our community and world urgently need transformational leaders, leaders who will be able to help us rethink who we are, our place in the world and as such, in the web of life. Those who have tirelessly studied biodiversity loss and climate destabilization know that this crisis can’t be understated. Youth must be the vanguard to speak the truth, inspire its peers and mentor a reluctant adult population to embrace a difficult but critical restructuring of societal values if humanity is to survive. Biologist E. O. Wilson coined the term, ‘biophilia’, to express a deep love and affinity for Nature that is shared by billions of people. Our community now has the chance to give youth aged fifteen through nineteen the opportunity to transform their intuitive love for Nature into an action/education plan that protects the Earth and be paid while they are doing so. This month long internship is meant to inspire and lead to further educational and action endeavours across our area. Georgian Triangle Earth Day Celebrations and Elephant Thoughts expect to launch the Eco Action Centre this August 3. Ten highly motivated and courageous youth will be paid $15 an hour for twenty hours a week for four weeks to perform hands-on leadership work that will lower community greenhouse gases while developing an understanding of why Canadians have such high carbon footprints that create climate instability in the first place. Outdoor work on biodiversity restoration and community education projects are just some of the ways that Eco Action interns will enhance their leadership skills. Throughout the four weeks in August our ten Action youth will initiate a clothesline installation plan to wean homeowners away from the inefficient use of clothes dryers. Eco Action youth will be a part of river conservation efforts that will range from fish monitoring, temperature testing, water sampling, and erosion control to meeting landowners who may become part of river restoration projects. Our hands-on partners at the Centre range from the Nottawasaga Valley Conservation Authority, Kolapore landowners to Free Spirit Tours. Community garden efforts are now under way with Collingwood’s Katimavik’s youth who are setting up the garden biodiversity experience that Eco Action youth will continue to nurture through August, and then help co-op high school students to take over right to harvest time. 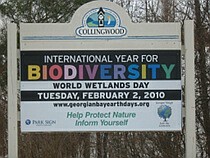 In 2011 we’ll start even earlier and include more people. Also, community gardens are a fabulous way to create intergenerational friendships and pass along knowledge. Twenty hours of paid work will be augmented with 15 hours a week of education on climate science and biodiversity issues that will give youth the fundamentals with which to go forward to be community ambassadors for real solutions. Books will be read and discussions will focus on creating a unified plan for conservation that also invites other high school and public school students to join in during the school year with a renewal of hope for their planet. Two well known Canadians will visit us to help inspire successful efforts. Thomas Homer-Dixon from the University of Waterloo and Albert Koehl from EcoJustice will sit down with Eco Action youth to help them formulate their action plan. 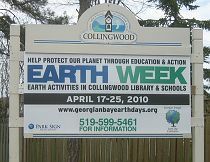 Interested youth should send a letter to celebrateearth@yahoo.ca using the subject, ‘Eco Action Centre’. Please tell us why you are passionate about our Earth and feel that you are the right person to be part of this intense and rewarding month long project. You are welcome to send a resume as well. Interviews will be held during the month of May and June.